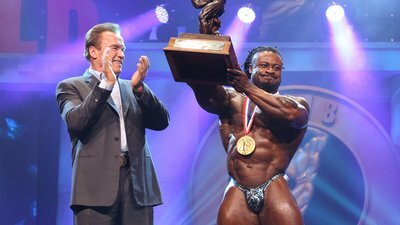 Bonac won the 30th Anniversary Arnold Classic in his first professional appearance on the famed Arnold Classic stage. William “The Conqueror” Bonac, a Ghana native now living in the Netherlands, dominated all three rounds of judging in cruising to his first major professional victory. It was the fourth career win for Bonac, who was third at the 2017 Mr. Olympia. Bonac won the 30th Anniversary Arnold Classic. Five-time Arnold Classic champion Dexter Jackson of Jacksonville, Fla., the winningest bodybuilder in history with 28 career wins, finished second and defending champion Cedric McMillan of Heath Springs, South Carolina was third. Bonac received congratulations from Arnold Schwarzenegger, a check for $130,000, a Tony Nowak Official Champions Jacket and the champion’s trophy from Catherine Colle of Midway Labs USA and Eric Hillman of Optimum Nutrition. Jackson, 47 received $75,000 and a medal from ROGUE Fitness and Jan Tana. The popular McMillan was third and received $50,000 from Animal and The Columbus Dispatch. Roelly Winklaar of the Netherlands finished fourth and received $30,000 from Blackstone Labs and Bodybuilding.com. Steve Kuclo of Dallas, Texas was fifth in his Arnold Classic debut and received $15,000 from Rule One Proteins and Ricart Automotive. Lionel Beyeke of France, competing in Columbus for the fourth time, was sixth and received $10,000 from Rivalus and MHP. His previous best finish was fourth in 2017. Also competing and finishing seventh through 13th, respectively, were Justin Rodriquez (New York, New York), Jonathan De La Rosa (White Plains, New York), Lukas Osladil (Czech Republic), Hidetada Yamagishi (Japan), Fred Smalls (Townsend, Delaware), Dennis Wolf (Germany) and Maxx Charles (Huntington, New York). Paul Poloczek of Germany also competed but did not finish.